英文摘要：A total of 422 bird species were recorded according to the survey and relevant data in Kunming area by December, 2013. Along with the change of environment, the bird species in Kunming also had corresponding change since 1963. Before 1963, Kunming had 316 bird species, and about 125.3 birds could be encountered per hour by walking. There were 270 bird species during 1963 to 2000, with 51.1 visible per hour, and this number was the lowest in 50 years. In the period of 2001 to 2013, 374 bird species were recorded, with 94.3 visible per hour (the black headed gull and other waterfowl species were not included), and this number was the highest in the history of Kunming area, indicated that the bird quantity was gradually restored. 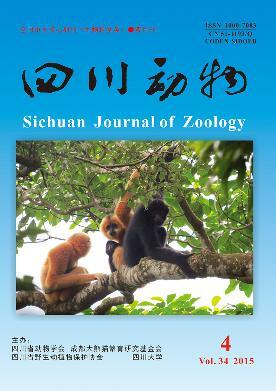 In the past half century, about 50 bird species of Kunming were lost, and 109 new species were identified, including 17 new records in Yunnan province and 1 new record in China. 杜寅, 周放, 舒晓莲, 等. 2009. 全球气候变暖对中国鸟类区系的影响[J]. 动物分类学报, 34(3): 664-674. 昆明市园林绿化局. 2002. 昆明园林[M]. 昆明: 云南人民出版社: 189-190. 罗康, 白皓天, 吴兆录, 等. 2013. 滇池湿地的鸻鹬类及铁嘴沙鸻和弯嘴滨鹬云南新分布[J]. 四川动物, 32(6): 926-931. 马建章, 宗诚. 2006. 加强城市鸟类管理, 构建人鸟和谐环境[M]// 保护鸟类和谐发展. 昆明: 云南科技出版社: 3-8. 彭燕章, 杨德华, 匡邦郁. 1987. 云南鸟类名录[M]. 昆明: 云南科技出版社. 孙全辉, 张正旺. 2000. 气候变暖对我国鸟类分布的影响[J]. 动物分类学报, 35(6): 45-48. 王紫江, 何纪昌, 匡邦郁. 1984. 昆明地区的鸟类区系[J]. 云南大学学报: 自然科学版, 9(2): 57-73. 魏天昊, 舒树森, 杨君兴. 2008. 云南鸟类一新记录——白翅浮鸥[J]. 动物学研究, 29(3): 344, 333. 新编昆明市情编委会. 1999. 新编昆明市情[M]. 昆明: 云南科技出版社: 28-30. 杨岚. 1994. 云南鸟类志(上卷 非雀形目)[M]. 昆明: 云南科技出版社. 杨岚, 杨晓君. 2004. 云南鸟类志(下卷 雀形目)[M]. 昆明: 云南科技出版社. 杨岚. 2005. 红嘴巨燕鸥云南鸟类种的新纪录[J]. 动物学研究, 26(6): 602. 赵雪冰, 吴金亮, 杨明, 等. 2009. 云南鸟类新纪录——三趾鸥[J]. 四川动物, 28(5): 752. 赵雪冰, 陈明艳, 和之雪, 等. 2013a. 云南省鸟类新纪录——黑腹滨鹬、彩鹮[J]. 四川动物, 32(1): 59. 赵雪冰, 和之雪, 王英, 等. 2013b. 云南省鸟类新纪录——中杓鹬[J]. 四川动物, 32(1): 155. 郑光美. 2005. 中国鸟类分类与分布名录[M]. 北京: 科学出版社. 郑作新. 2000. 中国鸟类种和亚种分类名录大全[M]. 北京: 科学出版社.